Having discussed some of the recent name changes in green algae in the previous post, I thought that I would continue this theme using some of the other taxa that I found in the samples I collected from the River Wear a couple of weeks ago. The plate below shows some specimens that, 20 years ago, I would not have hesitated to call Scenedesmus, characterised by coenobia of either four cells or a multiple of four cells arranged in a row. Over 200 species, and 1200 varieties and forms have been recognised although there were also concerns that many of these so-called “species” were, in fact, variants induced by environmental conditions. A further problem is that Scenedesmus and relatives do not have any means of sexual reproduction. This means that any mutation that occurs and which does not have strong negative effects on the organism will be propagated rather than lost through genetic processes. Working out what differences are really meaningful is always a challenge, especially when dealing with such tiny organisms. Scenedesmus and Desmodemus species from the River Wear, Wolsingham, September 2018. a. and b. Scenedesmus cf ellipticus; c. Desmodesmus communis. Scale bar: 20 micrometres (= 1/50th of a millimetre). The onset of the molecular era shed some new light onto these problems but, in the process, recognised differences within the genus itself that necessitated it being split into three, two of which are on the plate below. Scenedesmus, in this modern sense, has cells with obtuse (rounded) apices and mucilage surrounding the cells whilst Desmodesmus has distinct spines at the apices of marginal cells and, sometimes, shorter ones elsewhere too. In addition to these there is Acutodesmus, which is similar to Scenedesmus (i.e. without spines) but whose cells have more pointed (“acute”) ends and which does not have any surrounding mucilage. A further genus, Pectinodesmus, has been split away from Acutodesmus on the basis of molecular studies, although there do not seem to be any features obvious under the light microscope which can differentiate these. The genera Ankistrodesmus and Monoraphidium present a similar situation. In the past, these long needle- or spindle-shaped cells would all have been considered to be Ankistrodesmus. Some formed small bundles whilst others grew singly and this, along with a difference in their reproductive behaviour, was regarded as reason enough for splitting them into two separate genera. Both were present in the Wear this summer, but only Monoraphidium presented itself to me in a manner that could be photographed. Two species are shown in the plate below. Recent molecular studies seem to not just support this division but also suggest that each of these could, potentially, be divided into two new genera, so we’ll have to watch out for yet more changes to come. Monoraphidium species from the River Wear, Wolsingham, September 2018. a. and b.: M. griffthii; c. M. arcuatum. Scale bar: 20 micrometres (= 1/50th of a millimetre). 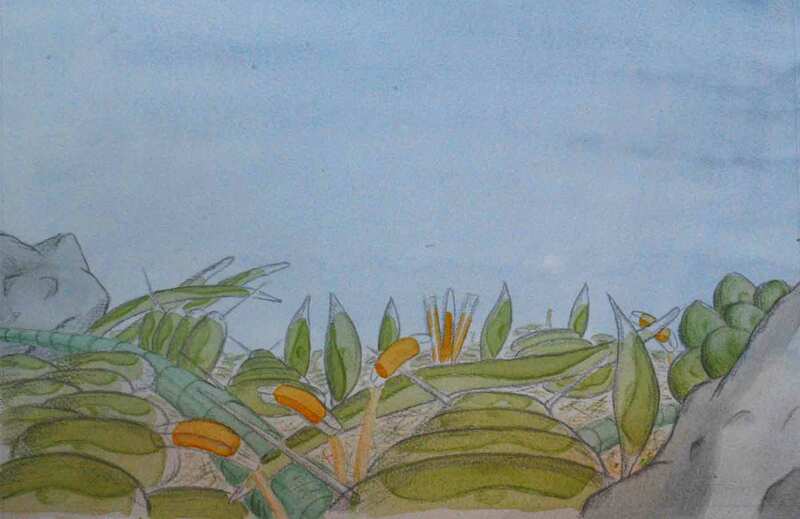 The final illustration that I managed to obtain is of another common coenobium-forming alga, Coelastrum microporum. Though the three-dimensional form makes it a little harder to see, cell numbers, as for Pediastrum, Scenedesmus and Desmodesmus, are multiples of four. I apologise if the picture is slightly out of focus, but it is a struggle to use high magnification optics on samples such as these. The oil that sits between the lens and the coverslip conveys the slight pressure from fine focus adjustments directly to the sample, meaning that the cells move every time I try to get a crisper view. That means it is impossible to use my usual “stacking” software. The answer is to use an inverted microscope so that the lens was beneath the sample. However, I do this type of work so rarely that the investment would not be worthwhile. Coelastrum microporum from the River Wear,Wolsingam, Septmber 2018. Scale bar: 20 micrometres (= 1/50th of a millimetre). An, S.S., Friedl, T. & Hegewald, E. (2008). Phylogenetic relationships of Scenedesmus and Scenedesmus-like coccoid green algae as inferred from ITS-2 rDNA sequence comparisons. Plant Biology 1: 418-428. Hegewald, E., Wolf, M., Keller, A., Friedl, T. & Krienitz, T. (2010). ITS2 sequence-structure phylogeny in the Scenedesmaceae with special reference to Coelastrum (Chlorophyta, Chlorophyceae), including the new genera Comasiella and Pectinodesmus. Phycologia 49: 325-355. Krienitz, L., Bock, C., Nozaki, H. & Wolf, M. (2011). 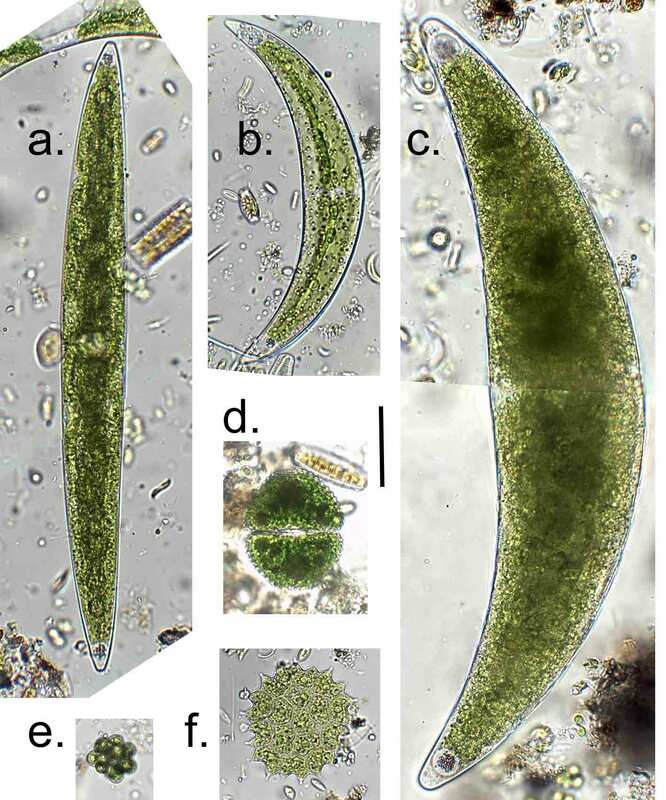 SSU rRNA gene phylogeny of morphospecies affiliated to the bioassay alga “Selanastrum capricornutum” recovered the polyphyletic origin of crescent-shaped Chlorophyta. Journal of Phycology 47: 880-893. Trainor, F.R. & Egan, P.F. (1991). Discovering the various ecomorphs of Scenedesmus: the end of a taxonomic era. Archiv für Protistenkunde 139: 125-132. A few algae lift my soul when I see them under the microscope through their beauty. To see such intricate yet symmetrical organisation in something too small to be visible with the naked eye never ceases to amaze and delight me. 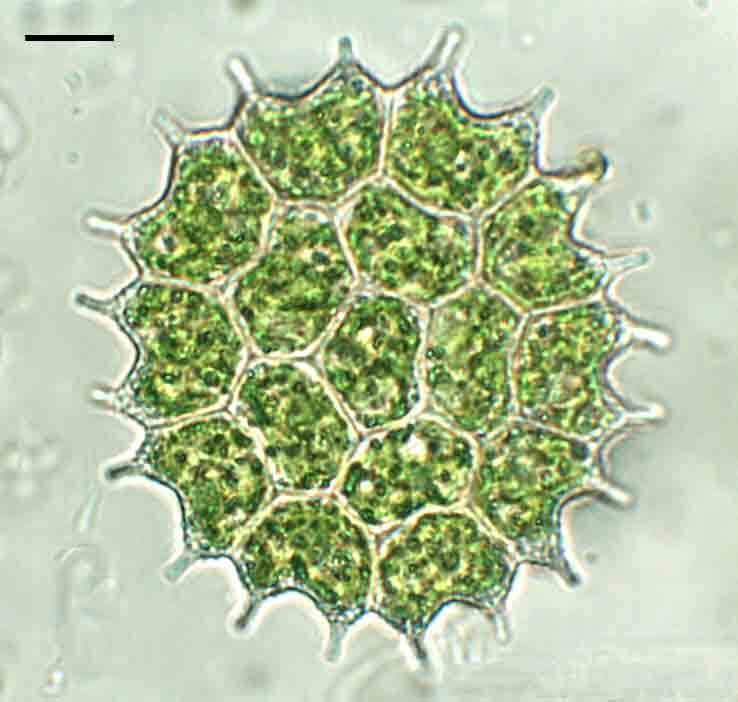 One of the genera that has that effect is the green alga Pediastrum, which forms cog-like colonies: flat plates of cells whose outer members bear horn-like projections. One of its representatives, Pediastrum boryanum, was common in the River Wear when I visited recently (see previous post). You can see, from the illustration above (the scale bar is 20 micrometres – 1/50th of a millimetre – long), the characteristic disc-like arrangement of cells, always in multiples of four (there are 16 in the colony above). There are many species of Pediastrum, differing in the shape of both the inner and marginal cells, and the number and length of the horns. I have found Pediastrum on many occasions in the Wear in the past, but never quite as abundant as it was in my most recent samples. Pediastrum boryanum is the species I find most often, here and elsewhere, but other species occur too. I have also found Pediastrum in some unusual places, including deep in lake sediments when I was searching for fossil pollen grains and there is evidence that the cell walls of Pediastrum contain both silica and a sporopollenin-like material (sporopollenin is the extremely tough material found in the outer walls of pollen grains (which probably explains why it had survived the fierce mix of chemicals that we used to prepare the lake sediments for pollen analysis). I am guessing that the sporopollenin and silica both add some structural integrity to the cells. 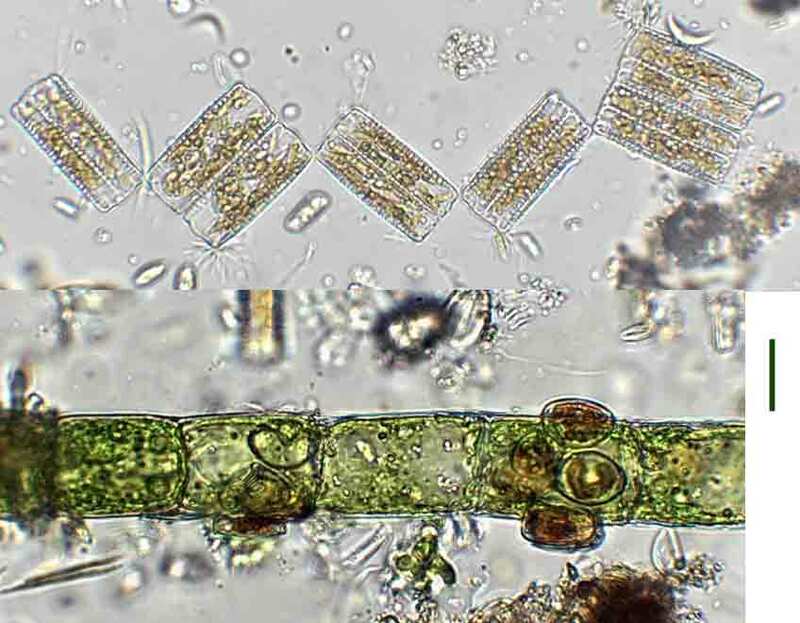 There are references in the literature to Pediastrum being planktonic but I often find it in samples from submerged surfaces and associated with submerged macrophytes, so I suspect that it is one of those species that moves between different types of habitat. 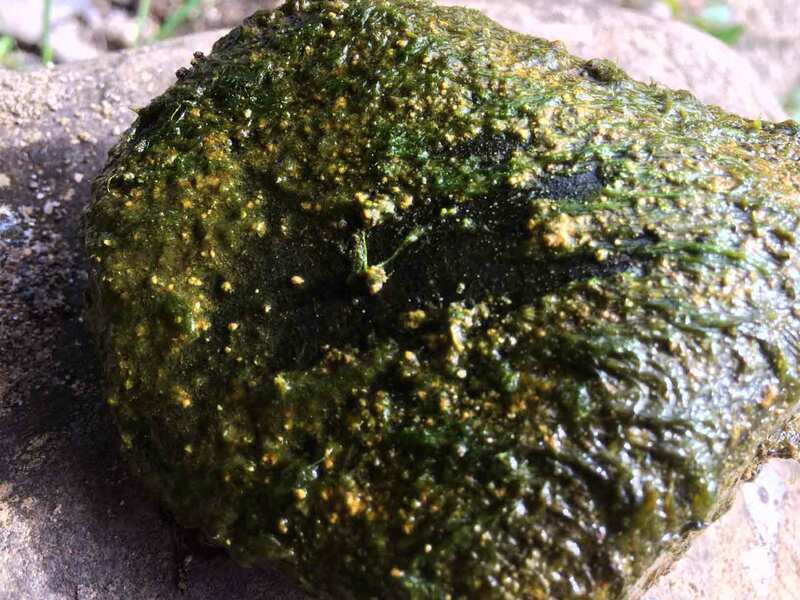 It should not really be a surprise that a relatively large colonial alga with a payload of silica and sporopollenin in addition to the usual cellulose cell wall, is going to be common in benthic films in a river towards the end of a long, dry summer. Pediastrum is another genus that has been shaken up in recent years as a result of molecular studies. 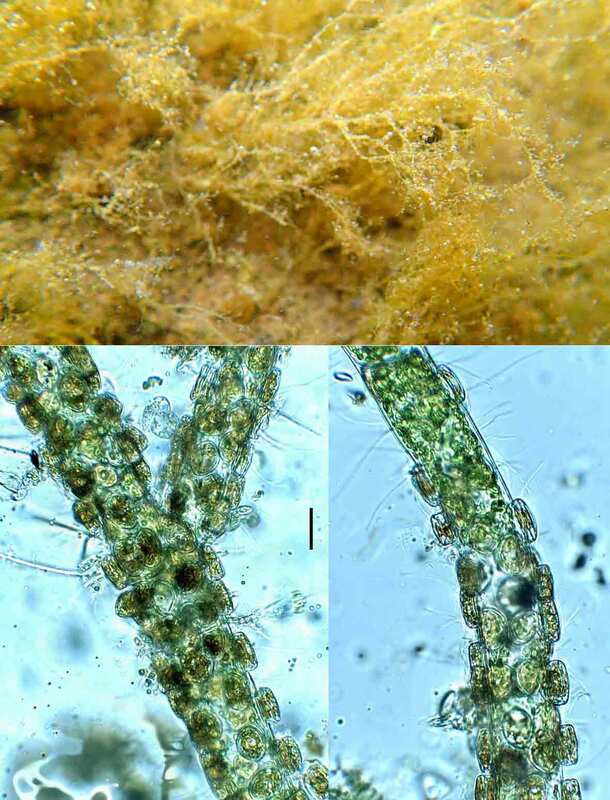 According to these, Pediastrum boryanum should now be called Pseudopediastrum boryanum although the Freshwater Algal Flora of the British Isles continues to use the old name. Not everyone agrees with this split (see McManus and Lewis’ paper in the list below) but the divisions suggested by molecular data do also seem to match differences in morphological characteristics of the group (see Table below). Pediastrum is part of the family Hydrodictyaceae and, as I was writing this, it occurred to me that I have never written about another interesting member of this family, Hydrodictyon reticulatum. As I like to accompany my posts with my own photographs, I spent part of yesterday afternoon tramping around a location where I have found Hydrodictyon in the past. All I got for my troubles, however, was two damp feet, so that post will have to wait for another day. 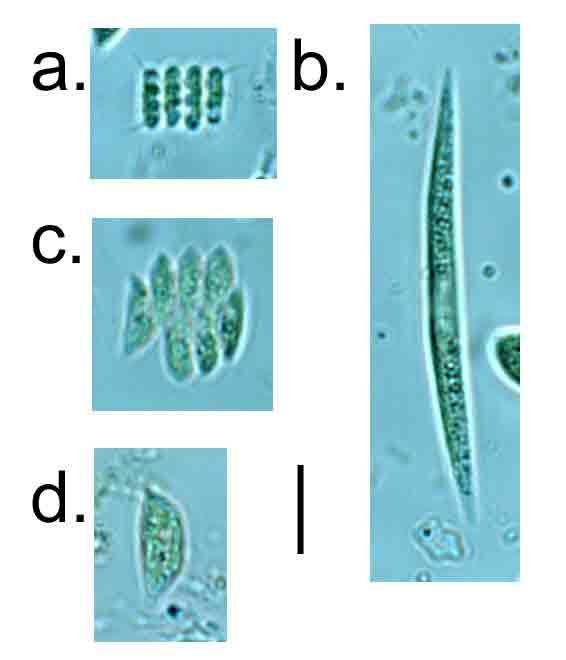 Differentiating characteristics of Pediastrum and similar genera (after Krienitz & Bock, 2011). Sorastrum Three-dimensional coenobia, each cell with two or four projections. * not all of the illustrations show marginal cells that are strictly “trapezoid” (e.g. with at least one pair of parallel sides). Buchheim, M., Buchheim, J., Carlson, T., Braband, A., Hepperle, D., Krienitz, L., Wolf, M. & Hegewald, E. (2005). Phylogeny of the Hydrodictyaceae (Chlorophyceae): inferences from rDNA data. Journal of Phycology 41: 1039-104. Good, B.H. & Chapman, R.L. (1978). 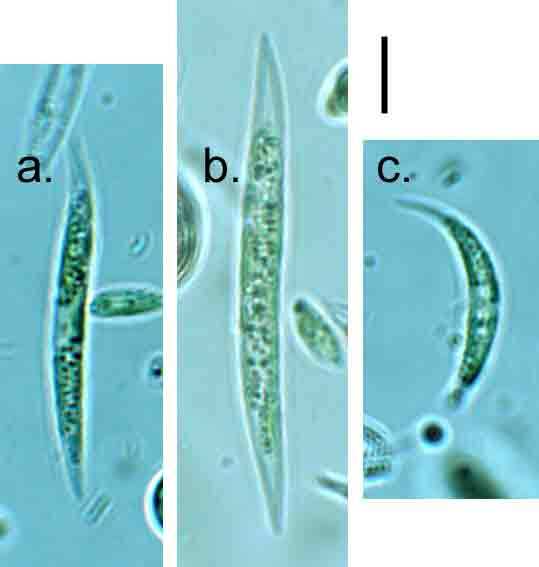 The ultrastructure of Phycopeltis (Chroolepidaceae: Chlorophyta). I. Sporopollenin in the cell walls. American Journal of Botany 65: 27-33. Jena, M., Bock, C., Behera, C., Adhikary, S.P. & Krienitz, L. (2014). Strain survey on three continents confirms the polyphyly of the genus Pediastrum (Hydrodictyaceae, Chlorophyceae). Fottea, Olomouc 14: 63-76. McManus, H.A. & Lewis, L.A. (2011). 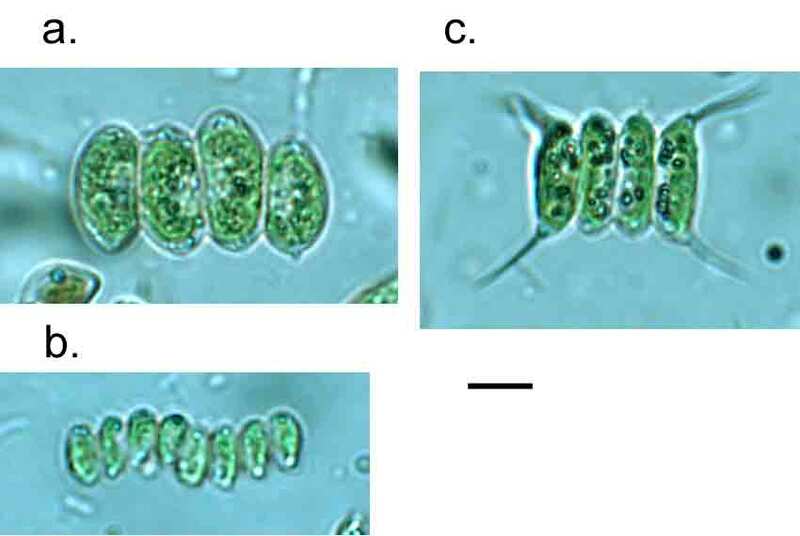 Molecular phylogenetic relationships in the freshwater family Hydrodictyaceae (Sphaaeropleales, Chlorophyceae), with an emphasis on Pediastrum duplex. Journal of Phycology 47: 152-163. Millington, W.F. & Gawlik, S.R. (1967). Silica in the wall of Pediastrum. Nature (London) 216: 68. I wrote about the effect of the long period of low flow in the River Wear a few weeks ago (see “Summertime Blues …”) and have, now, completed two dioramas depicting the state of the river in the main channel and in a filamentous algae-dominated backwater. The first of these is dominated by free-living green algae, either single cells or coenobia (see note at end), which is a big contrast to the situation I recorded two months earlier when the assemblage was dominated by diatoms, with patches of filamentous green algae (see “Spring comes slowly up this way” and “A question of scale”). I sent a small sample of the Wolsingham biofilm to Dave John for his opinion on the green algae, and he sent back a list with twenty one different green algae that he had found. Fortunately, this confirmed my own original list, with Keratococcus bicaudatus, Scenedesmus, Desmodesmus and Monoraphidium all featuring. He also commented that Keratococcus is hard to differentiate from Chlorolobium (which is also in his list) and that most of the green alga on his list are usually considered to be planktonic (Keratococcus and Chlorolobium are exceptions) although, as my earlier post suggested, these definitely formed a distinct biofilm on the surface of stones this year in the River Wear. A diorama showing the biofilm in the River Wear at Woslingham, July 2018. You can see coenobia of Demodesmuss communis (centre), Scenedesmus sp. 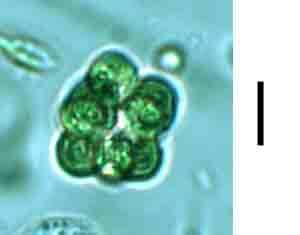 (left) and Coelastrum microporum (right – half tucked behind a mineral particle, along with single cells of Keratococcus bicaudatus (upright cells) and Monoraphidium. There are also some cells of Achnanthidium minutissimum on short stalks in the foreground and a cluster of Fragilaria gracilis cells in the background. There seems to be little hard evidence on the habit of Keratococcus and Chlorobium apart from references to a preference for benthic habitats. 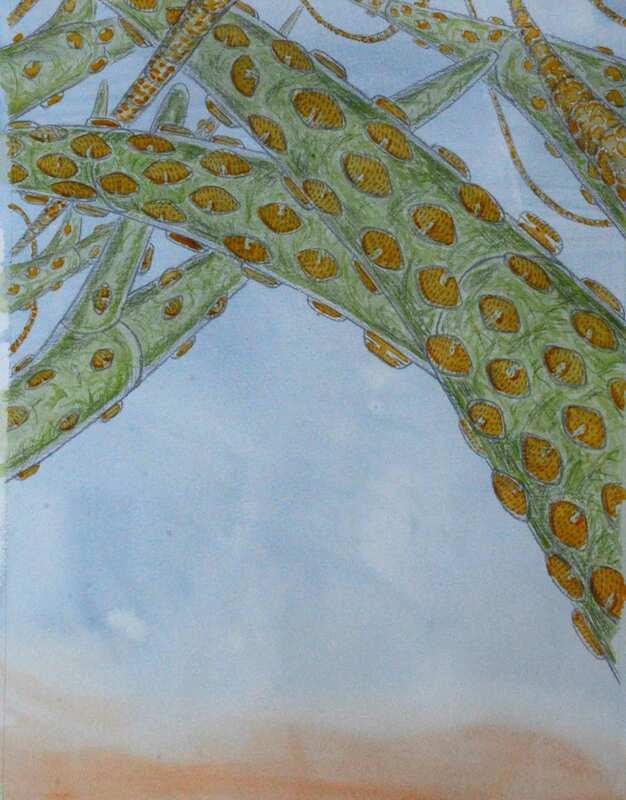 I have drawn them as upright cells, drawing on their similarity in form to Characium, for which there is better evidence of an upright habit (although Characium tends to grow on other algae, rather than on hard surfaces). Whereas I often have a strong sense of the three dimensional arrangement of organisms within benthic biofilms, so little has been written about the preferences of these green algae that, apart from the Keratococcus, I have had to show them as a jumble of cells and coenobia across the picture frame. The second diorama depicts the tangle of filamentous green algae that I found in the pools beside the main channel. As I mentioned in my earlier post, these are species that I do not normally find at this site and are here, I presume, due to the long period of unusually warm weather and low flows. One difference between these communities and that captured in my first diorama is that there is a more obvious organisation of the constituents here: the Cladophora filaments, though appearing as a tangle to us, form the foundation upon which epiphytes grow directly, but also around which Melosira filaments are entangled, rather like the lianas in a tropical rain forest. 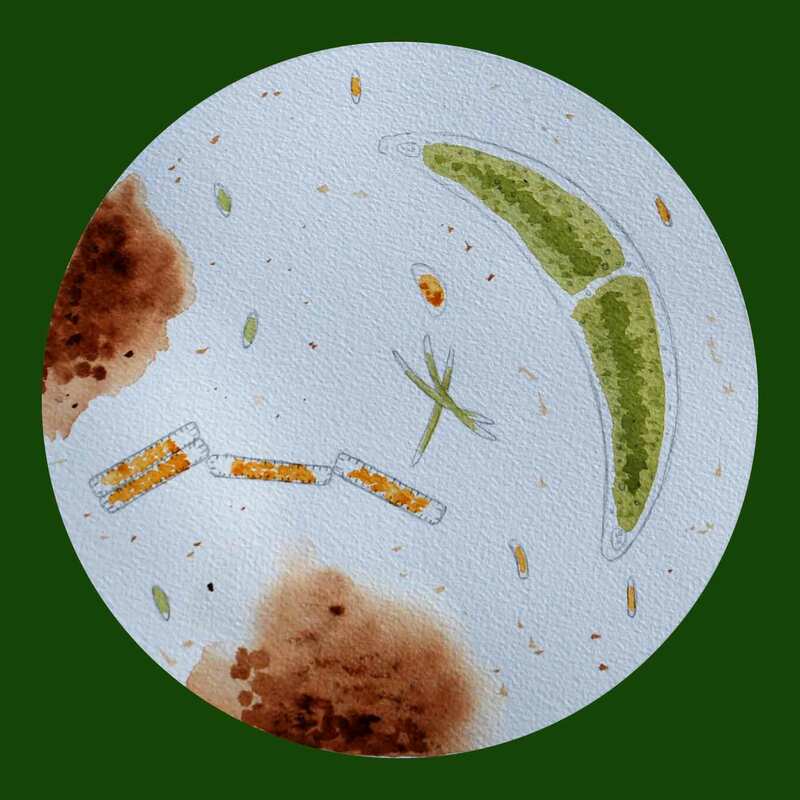 The quantity of diatoms around the Cladophora is so great that their brown pigments completely mask the Cladophora’s green cells but note how the density of Cocconeis cells reduces towards the tips – the youngest parts of the filaments. Depiction of filamentous algae growing in the margins of the River Wear at Wolsingham in July 2018, showing epiphytic Cocconeis pediculus and entangled Melosira varians. 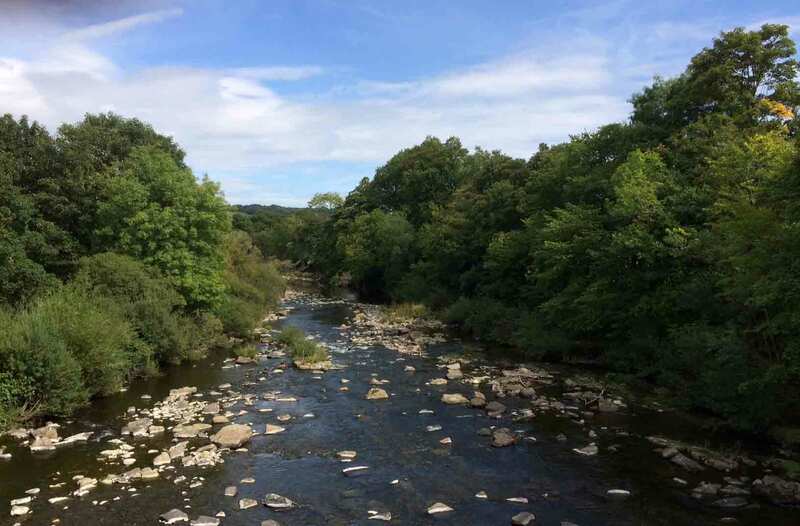 There have been some recurring themes in my posts this summer: one is that UK rivers have been behaving quite differently to previous years, due to a combination of low flows (more accurately, a lack of the scour associated with high flows) and warm, well-lit conditions. 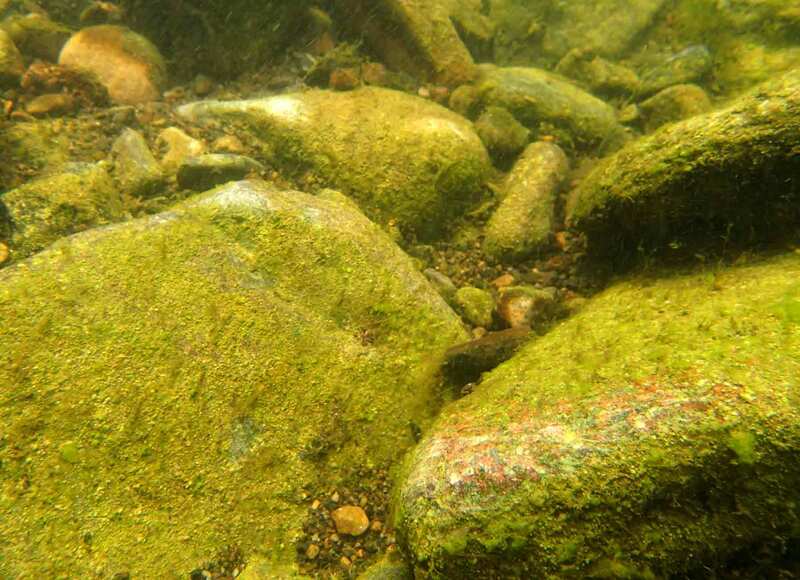 The low flows have also resulted, to some extent, in rivers becoming more physically heterogeneous, with side-pools and silty areas developing distinct assemblages of algae quite different to those encountered in the main channel. Sometimes, the sum of these effects is for rivers to look less healthy than is usually the case. 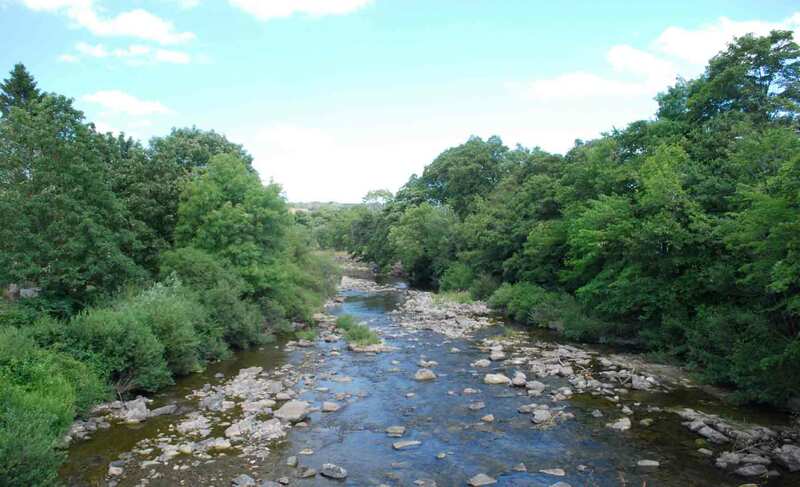 The Wear at Wolsingham is one of those sites that I like to think I know well, having visited the location so many times over the past 30 years. It is reassuring, in a rather humbling way, to know that it still has the capacity to surprise me. A coenobium is a colony in which the cell number is fixed at the time of formation and not augmented subsequently. Coenobia are particularly common in the Chlorococcalees.